Looking to upgrade your hot rod? Convert your 6-spline early Ford rear axle to a quick change with this kit. 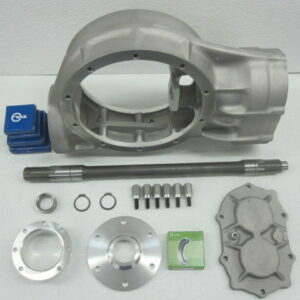 Every component of this kit is precision-machined and made in the USA. – This kit does NOT include change gears. – Machine work on the end of the pinion is required. Instructions are included. Polishing is also available at an additional cost. Please inquire about this when ordering if you are interested. Is this Rodsville Quickchange Open Drive Center Section exactly what you’re looking for? Add this product to your cart or call us at (208) 455-7971 to order today!